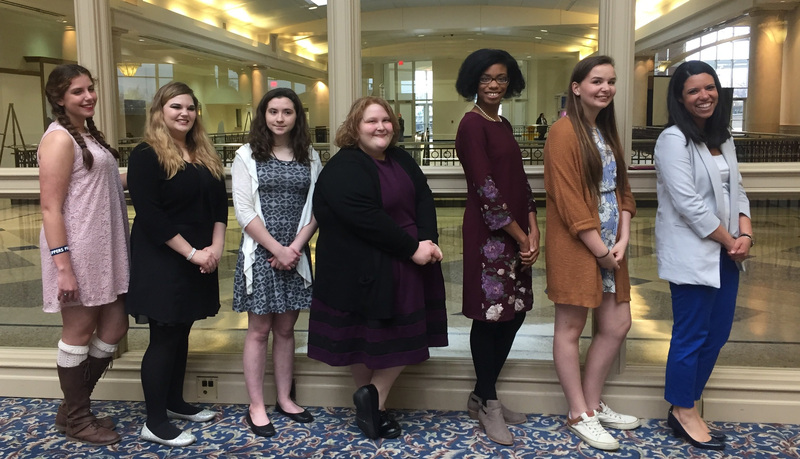 The March 29th Aspirations in Computing Awards ceremony recognized 14 Kentucky high school young women and 2 educators for their technology related interests and achievements. Family, friends, teachers, and organization sponsors gathered together to celebrate and support the growth and interests of Kentucky’s young women in tech. Along with the reception, honorees were awarded trophies and prize bags, worked through a networking activity, bonded over shared interests, and received recognition during the 2018 KY STLP State Championships at Rupp Arena. In addition to the young women, the ceremony also recognized Kentucky’s 2018 Aspirations Educator of the Year Award recipient, Micaha Dean Hughes of the University of Kentucky School of Engineering and KGSC Leadership Team, and Kentucky’s Educator Honorable Mention, Charles Cantrell of Nelson County High School. On behalf of the National Center for Women and Information Technology (NCWIT), Regional Affiliate Manager Eva Bradshaw spoke to the award recipients on their outstanding achievements and the networking and professional opportunities that come with this honor. KGSC co-chair Czarena Crofcheck gave a keynote address to the group where she encouraged the young women to celebrate their interest and to celebrate failure and accomplishment at every turn. Please contact aspirations@ncwit.org or the KY Coordinator, Elizabeth Farnsworth, with any questions about the Kentucky community.